We released Louis this morning to address some of the most influential apostles and pastors in the city. 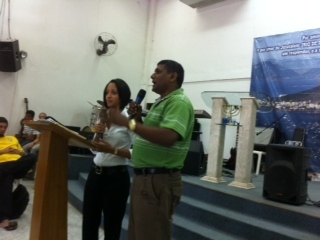 He spoke on serving the man of God and he shared many personal testimonies. He spoke about the unique relationship between Elijah and Elisha and encouraged leaders in the work of the ministry. There was also a spirit of repentance as Brasilian leaders remembered the violence against slaves from Africa and they washed our feet as an act of repentance. I then prayed a prayer releasing them in forgiveness. Wonderful morning in the Presence of God.